AUGUSTA, Ga. — Tiger Woods spoke softly for most of his press conference Tuesday afternoon at Augusta National. At the Masters, that’s no shock: subdued is sort of the vibe — indoors, especially. But then came one missive from the assembled media that changed his mood altogether. “The Masters might be the biggest collection of people on earth with no cell phones,” one reporter said. He didn’t even get to the question before Woods jumped in. “It’s nice, isn’t it?” he replied, flashing that trademark smile for the first time, the one you’re picturing right now. More often, he’s flashed that smile on the golf course than in the press center, but these are cell phones we’re talking about, and Augusta National, two subjects he cares about very much. It might not be that bad, but consider the premise of the reporter’s original question, because it’s a fascinating one. Augusta National the week of the Masters may be the largest collection of phone-free people in the developed world. It’s a social experiment and a time machine wrapped up in one. And Tiger Woods loves it. “This event is so different, and is so unique. It’s pure golf. You know, it’s just player and caddie out there playing. We’re prepping together and there’s no other distractions inside the ropes.” That’s not just a dig at phones: it’s a reference to cameramen, and reporters, and anything that might clutter the playing field, which at its most basic consists of he and Joe LaCava and an ocean of green grass. 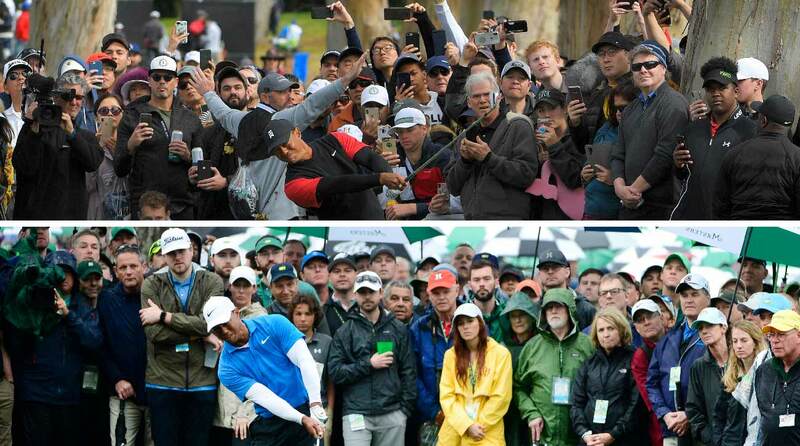 There's a visible difference in the way fans watch at the Genesis Open (top) and the Masters (bottom). Consider this possibility, too: Tiger Woods may be the most photographed human on the face of the earth. Who would be ahead of him? Woods plays around 20 tournaments per year, which means over 100 days in the public eye, each time laid out on display for five or more hours, always close to the ropes and to the galleries (especially on wayward driving days). Given that more than 100,000 spectators attend many of the events he plays, and that no fan leaves happy without an iPhone photo of the 14-time major champ, that means every year there could well be over a million people with a close-range shot of Woods. That’s insane. Tuesday was far from the first time Woods has addressed the phone craze. “I guess it’s different now because the art of clapping is gone, right? You can’t clap when you’ve got a cell phone in your hand,” he mused after his win at last year’s Tour Championship. He’s brought up this point several times to the press; cell phones make things sound different. People yell nowadays instead. The art of clapping is gone, right? You can't clap when you've got a cell phone in your hand." He addressed the issue again in advance of the Farmers Insurance Open. Woods walks the walk, too. He says he uses his phone almost exclusively to text, and doesn’t let his kids anywhere near social media. As for his phone stance? Part of it’s nostalgia, of course, but the camera-phone movement has also presented a fundamental shift in his day-to-day existence. Imagine your every minute in public was captured, photographed and scrutinized. It changes things. Rory McIlroy, another on the Tour’s most-photographed list echoed Woods’s sentiment almost exactly. “Wonderful, isn’t it?” he said of the no-phone policy. 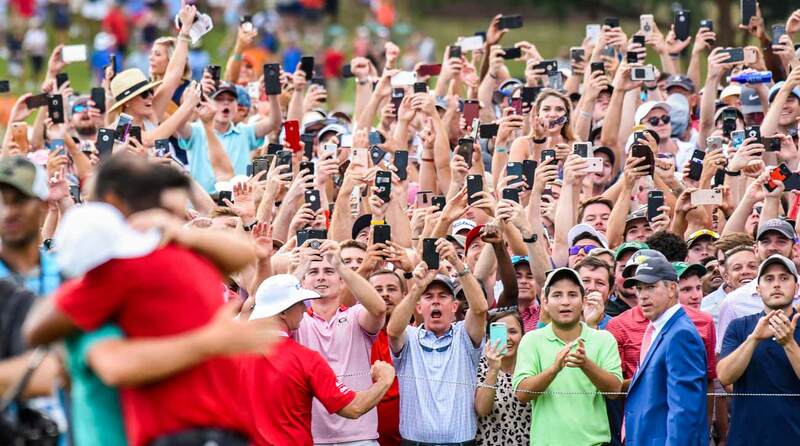 When Tiger Woods and Rory McIlroy embraced on the 18th green at last year's Tour Championship, legions of fans captured the moment. “I mean, playing a practice round yesterday, I said to Harry out there, “How good is it that people aren’t looking at their phones?” Yes, there are people with cameras, but they don’t constantly have their face in the device. It’s refreshing. Augusta is one of the few places that can pull it off. Their goal is lofty; this is the land where organizers orchestrate a world without phones, a world filled with conversation, filled with old, dusty digital cameras, filled with people who forgot just how hard it is to meet up on a large golf course without technology. Phil Mickelson says he expects the rule will change before long. He might be right. What’s certain is that cell phones — or the lack thereof — change the way fans watch. Once you have a phone, and the ability to capture the action, the goal changes. Watching becomes secondary; generating your own material takes over. Fans’ focus redirects from the players to the only thing more important: themselves. That muddies things up. For now, phones remain squarely placed in that category. Woods likes it that way. So does McIlroy. As for the fans, who don’t know the leaderboard, or the time, or what’s trending on Twitter? They secretly love it, too.